NEALE DONALD WALSCH on The Frederic Bye Show! And thus began the unfolding of the completely new and unexpected addition to Walsh's world-changing Conversations with God. That Trilogy ignited a new level of understanding, awakening and spiritual evolution for millions around the globe. Walsch never anticipated there would be more to his seminal work, until that August night in 2016. 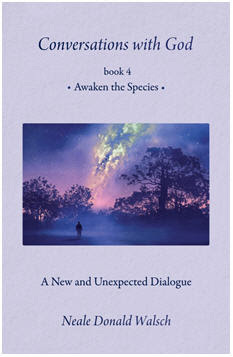 Now encompassed in Conversations with God, Book 4: Awaken the Species (Rainbow Ridge, March 27, 2017), readers will discover 16 specific examples of how Highly Evolved Beings respond to life differently than humans do-and how adopting even a few of those behaviors could change the course of world history for the better forever. Coming at a time when humanity is facing especially challenging times and an uncertain future, Conversations with Go, Book 4: Awaken the Species shows us that we can raise our consciousness to a new level of creation and action that provides individual and collective hope for mankind and the planet. The one Magic Inquiry that can guide you to far greater fulfillment in life, which further contributes to planetary evolution.